A new expansion – The Boomsday Project – is about to hit Hearthstone. There’ll be the usual mixture of new cards, new card types, and a fresh twist on the single-player content that’s become a staple of the game over the last year or so. As for the theme, Mechs are coming back to Hearthstone in a big way. If you cast your mind back to the days of the Goblins vs Gnomes meta, you may just remember an infamous character by the name of Dr. Boom. 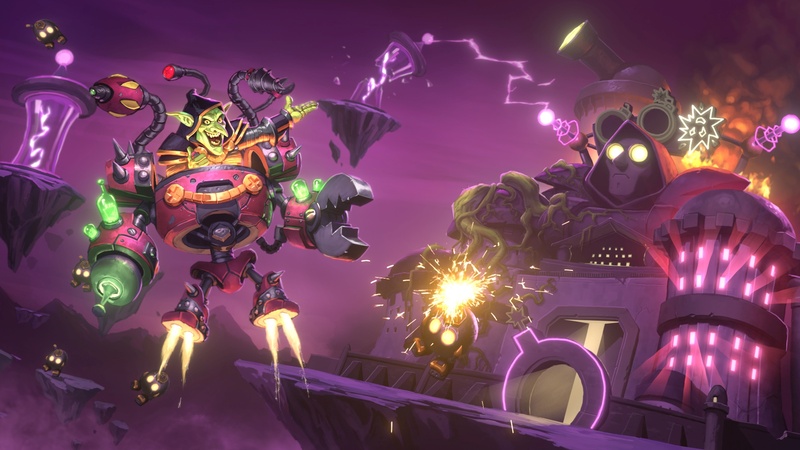 For the Boomsday Project, Dr. Boom has cooked up a host of mechanical contraptions – all in the name of science. In our Boomsday Project guide, we’ve rounded up all of the information you need to know about the expansion, from cards and keywords to pre-order information. Our friends at sister-site Metabomb are also busy producing articles for theorycrafted decks, and we’ll be updating this article with their latest creations so you can dip in and sample what’s on offer when the new card set goes live on 7th August. A total of 135 new cards are being added to Hearthstone with The Boomsday Project. As well as the usual mixture of class-specific and neutral cards (which all classes can make use of), there’ll also be a few interesting new card types. In each expansion, all nine Hearthstone heroes receive their very own Legendary minion. In the case of Boomsday, that means one scientist for every character. Electra Stormsurge, for example, is the Shaman’s Legendary Scientist, and comes with an extra special effect that causes the next spell you cast on the same turn to go off twice – handy for cards that boost minion strength in particular. The Warrior gets Dr. Boom, Mad Genius and this is the one hero transformation card that’s coming with Boomsday. Once transformed, all subsequently played Mech minions gain the Rush mechanic (allowing them to charge into enemy minions, but not the enemy hero), and the Warrior gains a new Hero Power which cycles through five different effects. Omega cards are special cards which perform pretty well when played in the early to mid-game, but become a good deal more powerful once you find yourself with ten Mana Crystals in the bank. At that point, a special new effect is triggered when the card is played. One example is the Warlock’s Omega Agent. This 4 / 5 minion costs 5 Mana when played in the mid-game, but if you drop it on the board with you have 10 Mana, you’ll actually summon three copies of the minion instead. Although Legendary cards have sort of featured in Hearthstone in the past (in the form of Quests), Boomsday is the first time this rarity of spell has truly made it into the game. Just like the Legendary Scientists, each class gets their own unique Legendary Spell to play around with. The Shaman, for example, receives a spell called The Storm Bringer. Costing 7 Mana to cast, it transforms all friendly minions into randomly chosen Legendary minions instead. It’s likely to see a bit of play in the Token Shaman archetype, where you seek to build a very wide board of minor minions which you then want to boost up in strength. A new card keyword is also being added. Called Magnetic, it will appear on a number of the new Mech minions. Play a Magnetic Mech to the left of another friendly Mech, and the stats and bonus effects of each one will be automatically melded into one minion. If you just want to play it as a separate entity, pop it to the right of the target instead. Our sister-site Metabomb is currently putting together theorycrafted guides to the new archetypes likely to emerge in the Boomsday meta. All will be refined into final deck guides as the launch date approaches, and as new guides are published we’ll include the links in here. We’ll also split them out by hero once everything’s finalised. If you’re lucky enough to get Whizbang the Wonderful from your card packs, you’ll be able to play one of 18 Deck Recipes – chosen at random – by popping him into a new deck. For an idea of what to expect, Metabomb has a Whizbang the Wonderful guide which contains all of the applicable deck lists. Mecha’thun is another interesting new Legendary card. This ten Mana 10 / 10 Mech has a very interesting Deathrattle effect which instantly wins you the game if you’ve no other cards on the board, in your hand, or in your deck. Metabomb has a collection of Mecha’thun deck lists that you might like to mess around with if you get your hands on this one. As far as single-player content goes we’ve had the roguelike Dungeon Run and Monster Hunt modes to tuck into over the last 12 months of Hearthstone. In the Boomsday Project, however, the Puzzle Lab will provide 120 puzzles to chew over instead. Beat the lot of them and you’ll unlock a special card back. Board Clear – Here you’ll have to completely eliminate all minions on the board. Lethal – You’ll have to overcome the board state to deliver lethal damage to the AI opponent. Mirror – In these puzzles you’ll have to accurately replicate the opponent’s side of the board. Survival – As the AI rains down the hero power pain, you’ll have to survive long enough to claim victory. Hearthstone: The Boomsday Project expansion launches on August 7th.